David Rhodes - Bozas International Ltd.
David started playing guitar in his early teens, he started an experimental performance group with David Fergusson , called Random Hold, where they were joined by bassist Bill MacCormick, vocalist/guitarist Simon Ainley and drummer Pete Phipps. The Randoms achieved some early success, came to the attention of Peter Gabriel and were subsequently invited to open for Gabriel on his 1980 U.S. tour. Soon after the tour, David left Random Hold, and has continued to record and tour with Peter Gabriel ever since (a 28-year collaboration). In addition to his work with PG, David has produced albums with T-Bone Burnett, Akira Inoue, Indio and Massimo DiCataldo. He composed the soundtrack for the Italian animated film “La Gabbianella E Il Gatto”. David also collaborated with Peter Gabriel and Richard Evans on the Golden Globe nominated soundtrack “The Long Walk Home”, music from the film “Rabbit Proof Fence” as well as working with Richard Evans composing music for film and TV (usually credited as “The Footnote”). He has lent his distinctive guitar style to albums by a wide variety of artists, including Roy Orbison, Paul McCartney, Joan Armatrading and The Pretenders (see discography for complete listing). David played guitar on the first Geoffrey Oryema Album “Exile” lending his sound to the big hit Ye Ye Ye. Years later David then came back to help Geoffrey out in the new album From The Heart contributing to the fantastic track “La Lettre”. 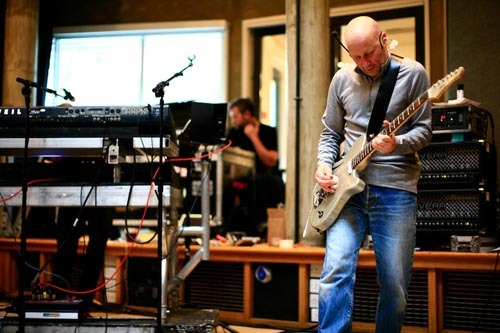 David is recently played guitar on the Peter Gabriel “So – 25th anniversary tour” as well as touring his own band ( a power trio featuring Charlie Jones (Bass) and Ged Lynch (Drums)) in Italy. He has been working and touring with Blancmange during 2017 as well as working on 2 animated film projects for Italian Film director Enzo D’alo. Prince of Sand and A Ghost of a Girl.